Tessa Dunlop is the Author of The Bletchley Girls (Hodder & Stoughton 2015) and To Romania with Love (Quartet 2012). She is currently doing a PhD at Sheffield Hallam on Romanian identity during World War I, having been awarded a scholarship. She can be seen hosting history documentaries including BBC2’s Coast, and heard on Radio Four’s ‘Crossing Continents’ series among others – including a one-off half hour called ‘The Bletchley Girls’. Long gone was the Yorkshire vicarage with its abundant garden; now Rozanne at a peachy 15 was deemed old enough to accompany her father to his latest posting. Charles Medhurst was appointed the British Military Attaché in Rome with a mission to monitor Italian rearmament. But to hear Rozanne reminisce it is easy to forget that the fascist state was moving inexorably towards war. She loved her time in Italy; the weather, the language and the people. From her school girl perspective the adventure has a naive, occasionally comical quality. At ninety-two Rozanne remains an adept storyteller. She leans in. ‘I even met Hitler! I shook his hand.’ As a family member of the British diplomatic mission 16 year old Rozanne was there, waiting on the platform when in May 1938 Hitler and his circus of 500 Nazis arrived to woo the Duce. ‘He looked much more normal in the flesh than I imagined.’ Rozanne shuts her eyes, briefly his man’s hand is back in her slender, innocent clasp. Then the moment passed. Mussolini had arrived and the military parade began. ‘Gosh yes! And you know Hitler looked much more normal in the flesh, I had imagined a Charlie Chaplin type figure with a black moustache. But he did have fanatical blue eyes, I remember them vividly.’ It was all so surreal, something of a game, but then Rozanne was only a child; a helpless bystander flanked by the glistening edges of an ugly undercurrent. In 1942, equipped with school girl Italian and a scarlet bicycle, Rozanne entered Britain’s most secret organisation. With typical modesty she plays down her role at Britain’s giant code-breaking centre. It was all so unlikely, on the flats of Buckinghamshire, teeming with girls just out of school, mushrooming huts and blocks, a conveyor belt of corridors, closed doors, and classified information. Rozanne still enjoys recalling the peculiarities of the place, in particular the friendships she made – an Oxford Don twice her age and a professional actress whose à la mode style caught her eye – but what she actually did at this Park, a mere cog in a giant wheel, is harder to grasp. The less said the better; unnecessary information endangered lives. Rozanne furrows her brow. She was in the Italian Air Force Section. Under orders from Hitler, in March 1941 General Rommel’s Afrika Korps arrived in Libya to bolster the flaying Italians. The subsequent war in the desert was a protracted bloody affair and the interception and decoding of high grade Italian Air Ciphers proved invaluable. Far removed from the action Rozanne was hunched over ‘reams of paper, girls would bring in great bundles in haversacks.’ She shakes her head. ‘I was a decodist; there was a technique you learnt to break the code. It was quite specialised. You tried out various numbers until bits of words started to make sense. A lot of it was humdrum stuff.’ Rozanne waves her hand dismissively. She is keen to underline the more important men who surrounded her. The days streamed past in a haze of shifts. ‘When we began work there was silence and total concentration. ‘ Then a tea break of ten minutes after two hours was followed by ‘work and a concentrated silence again.’ A young girl, albeit one who spoke Italian, Rozanne might have slipped through the war unaware of any specific mark she had made against an enemy she knew personally. 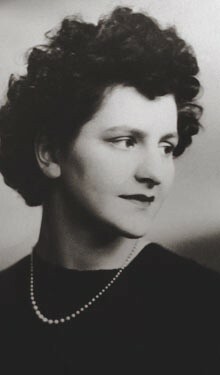 Much of Bletchley Park’s intelligence was based on the forensic decrypting and ordering of thousands of enemy messages, Rozanne was a part of this vast process. Her elementary decoding skills helped uncover general patterns of communications and confirmed logistical information. Not quite the noble war she had longed to fight, not really what she had imagined. But then, war is unpredictable. Rozanne was working late. It was 1.30 in the morning and with the exception of Joe Hooper (later head of GCHQ) she was alone. It is easy to imagine her, gamine and pretty in a modest jersey and skirt, pearls resting on the nape of her long neck, head poised and attentive. ‘I was decoding a message freshly arrived on the teleprinter. After many trials and errors … the ‘groups’ of numbers began to make sense, yes, and I found myself faced with a message that made sense.’ Staring back at Rozanne in the middle of the night was an important Italian message she had personally unpicked. In a small room in Buckinghamshire she was reading something no one else in the Allied Forces knew. In 3 and a half hours time at 4am, Italy’s SM.79 Torpedo Bombers and SM.82 transport carriers were due to leave Tripoli and head across the Mediterranean. ‘Imagine the thrill! I told Joe Hooper about the message and he leapt from his desk in wild excitement. He tore along the passage to Josh Cooper’s room. With the Desert War over in early 1943 the crippled Italians were heading for Sicily, but thanks to Rozanne they never reached their final destination. ‘It was the only time I did something useful in all the years I was at war. The whole place was alive with excitement. I got a pat on the back!’ A rare accolade for a humble Bletchley girl. And then suddenly, towards the end of her euphoric story Rozanne’s face crumples, she looks anxious, almost scared. ‘It was awful, terribly sad to think of all those Italians being shot down. I lived in Italy, they were my friends.’ Sunshine and silly old Musso, Italian mamas, pasta and pavement cafes, it all comes flooding back. Rozanne had fired a lethal shot into the heart of Italy without leaving her desk in England. Seventy one years on, the young triumphant girl long gone, Rozanne is fleetingly revisited by the confusion of war and her own part in it.